Synopsis: Having nothing left to lose changes everything. 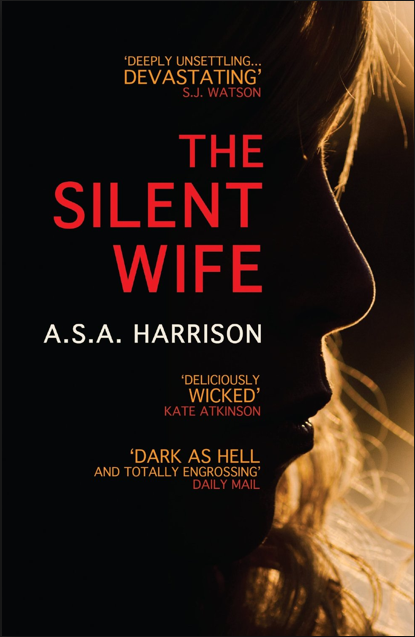 I really enjoyed The Silent Wife but I have to say the hype whipped up on the cover with quotes like “Deeply unsettling… devastating” and “dark as hell and totally engrossing” are a bit of a misrepresentation. I actually found it to be quite a light read, almost gentle in its portrayal of some quite gruesome facts. I chose to overlook the hype and judge it purely on the books itself with no preconceptions. If I had been appraising it based upon the quotes and the hype I could only have gone with a 2 as it just isn’t as it has been described. However, basing it purely upon itself, I thought it was a great story and I did find it hard to put down at times. I must confess though, there were several sections that I merely skim read as they were of no interest to me as a reader and most certainly detracted from my enjoyment of the story. By this I mean the sections that refer to Jodi’s relationship with her brothers, which in the actually contributed nothing to the story as it was all just hints and suggestions. There were other sections which just over explained stuff that again I found myself skim reading. I think the book would benefit greatly from having them either shortened or removed. The Silent Wife is definitely a psychological thriller and it certainly made me think about Jodi’s reactions to things and made me reflect upon how I might react if faced with the same situation. I didn’t find it ‘dark as hell’ but who knows maybe I’ve read so many of these things now that I’m desensitised! Personally, I would definitely recommend this book to friends who enjoy an emotional thriller and despite the subject matter I would even be inclined to recommend it as a light holiday read.